We are thrilled to announce that SQL Data Warehouse (SQL DW) has released accelerated and flexible restore points for fast data recovery. SQL DW is a fully managed and secure analytics platform for the enterprise, optimized for running complex queries fast across petabytes of data. The ability to quickly restore a data warehouse offers customers data protection from accidental corruption, deletion, and disaster recovery. We have seen scenarios where compliance requirements and having multiple test and development environments of a data warehouse enforce stricter capabilities in this area as well. To continue delivering first-class data protection and recovery, we have released the following critical improvements which are seamlessly integrated within the Azure Portal. You can now restore across regions and servers using any restore point instead of selecting geo redundant backups which are taken every 24 hours. Cross region and server restore is supported for both user-defined or automatic restore points enabling finer granularity for additional data protection. With more restore points available, you can be assured that your data warehouse will be logically consistent when restoring across regions. You can now restore your data warehouse in less than 20 minutes regardless of its size within the same region. Fast restore is also applicable for cross server restore if the target server is within the same region. In addition, the current snapshot process has been optimized which reduces the time it takes to create a restore point. For lower performance levels (DWU), this performance enhancement has shown a reduction in the time it takes to create a restore point by at least 2X. 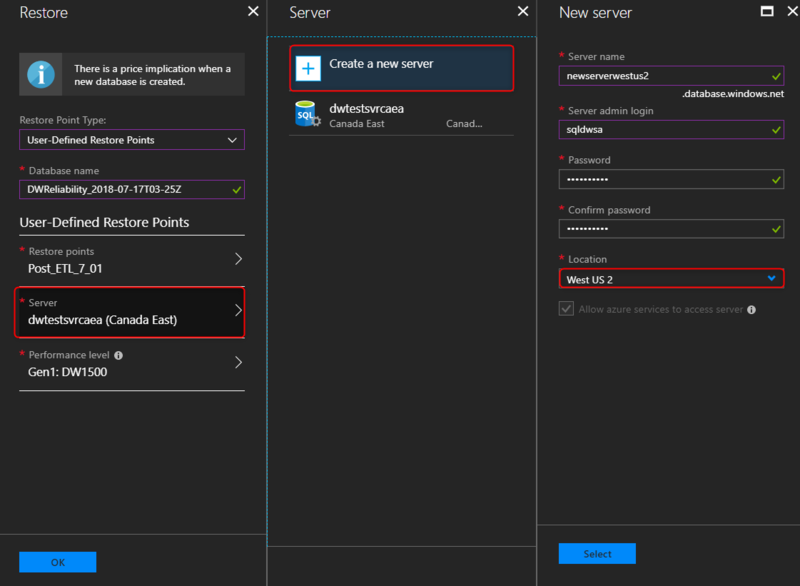 When restoring your data warehouse through the Azure portal, not only can you now change your performance level (DWU) when restoring in the Azure portal but you can also restore to an upgraded Gen2 data warehouse. This enables a side-by-side evaluation before upgrading your Gen1 data warehouse. Visit our online documentation for more details on data recovery with SQL DW.